"Quick, easy almond shortbread cookies that can be prepared ahead of time and taken from the fridge to bake in only 15 minutes. Melt in the mouth. 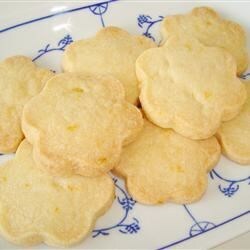 You can decorate the shortbread with almond slivers instead of whole almonds, if you like." In a medium bowl, cream together the butter and confectioners' sugar until very light. Gradually add the cornstarch, all purpose flour and nutmeg. Stir until well blended. Turn the dough out onto a lightly floured surface, and knead for a few turns. Divide the mixture into 2 parts. Roll each part into a roll about 6 inches (15 cm) long. Wrap the rolls in plastic wrap or wax paper, and refrigerate for at least 1 hour. These can be refrigerated for up to 1 week. Unwrap the rolls and slice into 1/2 inch thick slices. Place onto the prepared cookie sheets. Gently press an almond onto the top of each cookie. Bake for 12 to 15 minutes in the preheated oven. When cookies are cooled, store in an airtight tin to preserve crispness. added 1tsp almond extract- melt in your mouth delicious! These were EASY and Quick to both make and devour!